In 1926 the musicologist Alberto Gentili discovered a wealth of unpublis­hed and previously unknown original manuscripts by Vivaldi in a convent in Alessandria, Italy. After their significance became clear, their ensued a long legal battle over the publication and performance rights. Not until after World War II could the works be made public. All of the newly discovered works, together with all the other works of Vivaldi's unpublished in his lifetime have been catalogued by Peter Ryom and bear an "R" number. 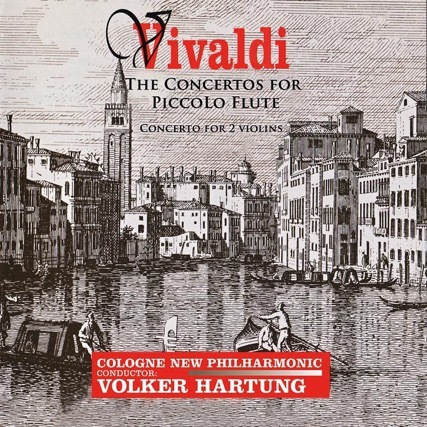 Among these are the three 'Piccolo Concertos' heard on this recording- the only known works Vivaldi composed for his smallest and most agile mem­ber of the orchestra family. The dates of composition cannot be established with certainty. The instrument which Vivaldi knew, the sopranino recorder, bears impor­tant differences to the modern Boehm piccolo: The recorder is inserted bet­ween the lips and played vertically, the piccolo rests on the lower lip and is played transversely; the recorder had simple holes where the piccolo has silver keys and a modern scale allowing all chromatic possibilities. The instrument played by Mr. Schubert in this recording was crafted from grenadilla wood (body) and sterling silver (mechanism) by Philipp Hammig, Markneukirchen, East Germany, in 1990.